Click photo to download PDF file. We’re proud of our growth and the larger journey on which we’ve embarked. We are aware of what we have achieved, but recognize that there is much work to do to meet the aggressive plans we’ve set for ourselves. Our staff and board continue to work toward common goals focused on the philosophy and practice that empowers people with disabilities and enables them to exert influence, choice and control in every aspect of their life. Through collaborations with other organizations, TWP works to ensure that people with disabilities are fully integrated into the community. 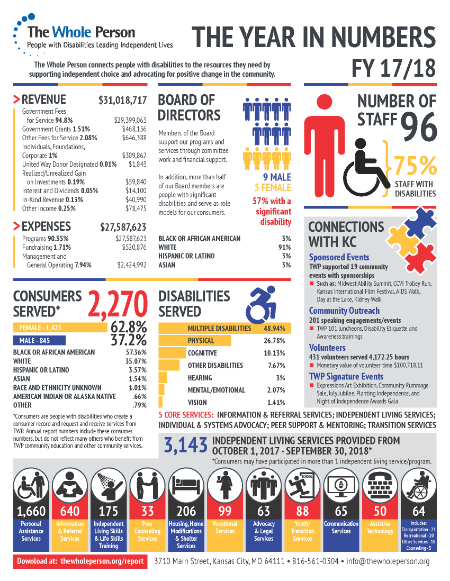 The 2016/2017 Annual Report is an infographic that depicts the year in numbers, illustrating strong deliverables of measurable outcomes, statistics and advocacy activities that show our broad range of influence in the community. Our fiscal year runs October 1 through September 31. All PDFs links are low resolution for quick download. We make our IRS Form 990 available for review, as required by law via Guidestar.org.